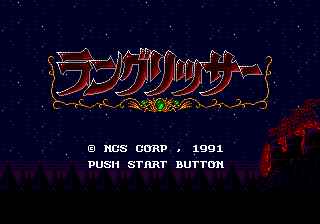 Langrisser (Japanese: ラングリッサー, Korean: 랑그릿사) is a turn-based strategy RPG developed by CareerSoft, a division of NCS. 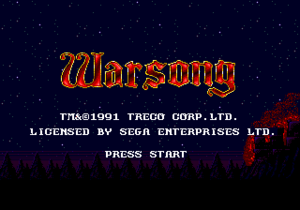 It is the first game in the Langrisser series and the only game to be released outside Japan and Korea — released in the US by Treco under the name Warsong. This game was later remade with Langrisser II in Langrisser: Dramatic Edition for the Sega Saturn, which was in turn included in the Langrisser Tribute compilation, also for the Saturn. The game has fairly complex gameplay mechanics which are difficult to explain in a few paragraphs. Each map begins with a story exposition sequence, followed by a "Battle Preparations" screen, where the player is shown each of his playable story characters. On this screen, the player can assign the characters up to eight generic soldiers to command - each under a different "class" with advantages and disadvantages - and then equip items, and assign the starting positions for each character on the battle map. After this, the player gets more plot exposition and then his first player phase. The player can move any of his character (including the generic soldiers, who can optionally be AI-controlled) around the map and fight enemy units. Battle Maps take on an appearance resembling standard top-down RPGs, and have complex terrain rules. When a unit goes into combat, a new screen shows up which displays the outcome of the encounter. When a unit is completely wiped out, experience points are rewarded to the commander of the victorious troops, which are used to gain levels and change into one of the multiple, branching character classes, each with combat advantages and disadvantages. When a player ends his turn or runs out of units to move, the enemy phase begins. Each map has a context-based objective, ranging from escaping an area, to defeating a commander, to surviving a certain amount of turns. When the objective is met, the player advances to the next map. The player gets a Game Over if the Lord-class character, Ledin (Known as Garrett in the US release Warsong), is slain in combat, or if there is a failure to fulfill a certain context-sensitive objective, such as protecting a certain unit. In this game, a story character who is defeated in battle is dead for the rest of the game. This trait is not followed in latter Langrisser-series games. Besides the title of the game, Warsong also changed the names of all the characters and many of the items. The graphics were also redone, altering the anime-esque look of the original game into more "masculine" character designs.